NewBay Media announced the recipients of its AV Technology “Best of Show” status for the Integrated Systems Europe 2017 convention in Amsterdam. Digital Signage had a significant showing at ISE, and there were some interesting entries from companies large and small. Among the notable winners with Digital Signage offerings: Sony, with their CLEDIS displays that made a big splash last summer at InfoComm in Las Vegas; Kramer;s Video Content Overlay Solution as intriguing– and from a company not heavy in digital signage heretofore; BenQ's SL550 Smart Signage LED display, and Hall Research's offerings also garnered attention. “Attention to detail, emphasis on the end-user, & breakthrough features made these standout products this year,” said NewBay's Margot Douaihy." “Awarding ISE ‘Best of Show’ laurels was incredibly difficult this year,” Margot Douaihy added. “With more than 3,000 products on display at the RAI, representing a global proAV/IT industry, there are exciting developments in networked audio, 4K video, cloud control, connectivity, collaboration, and so more. However, the ‘Best of Show’ honor recognizes benefits for tech managers first and foremost, and offers readers a curated list of ‘can’t-miss’ solutions. Our team weighed the system or product’s uniqueness of the feature-set, perceived value proposition, ease of deployment and use, network impact, and reliability. We were so impressed this year, and we know you will be, too. 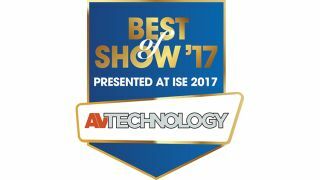 Congratulations to all the 2017 ‘Best of Show’ winners.”Visit www.avnetwork.com for more ISE news, analysis, and product debuts.